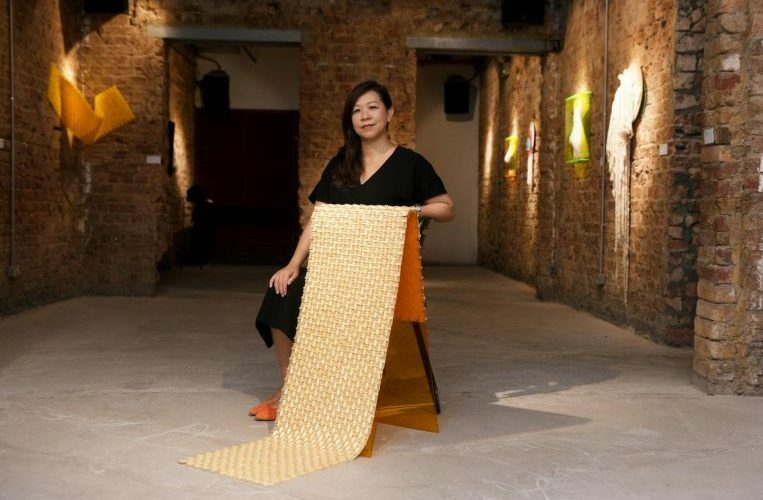 SINGAPORE – Paper is the warp and woof of artist Hazel Lim’s works. But while her creations mimic the look of woven or textile crafts, do not let them pull the wool over your eyes. Her textile-like creations, which are on display at the UltraSuperNew Gallery in Rowell Road – part of a two-woman show called Planes And Envelopes – each comprises hundreds of folded paper squares that have been slotted and glued together. Some are U-shaped and hang from the walls. Others feature wave-like undulations illuminated by light filtered through neon frames. Lim, who trained as a painter, did not rent a studio after graduating as she was busy with work. “Why not do something portable, something I could do anywhere?” she wondered. So she decided to create “sculptural” art pieces made of small origami-style squares, which can be folded anywhere. The 43-year-old, who is also a BA (Hons) fine arts programme leader at Lasalle College of the Arts, is one of several artists in Singapore who have decided to use paper – traditionally regarded as a “lesser” medium – as a central subject in their work. Most have elevated the material to a new level, going beyond traditional applications in origami or as a surface for paint. Paper artist Cheryl Teo, 31, founder of Lulo Paper Studio, posts her colourful creations on Instagram (@captain.lulo) and has more than 15,000 followers. She has made miniatures of everyday objects – from laksa to a sewing machine – and, like Lim, was drawn to paper art by space constraints. These works are designed on Adobe Illustrator, hand-cut and then glued into shape. A small 5cm-high sculpture could take her five to six hours to complete. The graduate of Nanyang Technological University’s Art, Design and Media course also receives commissions from organisations. She recently created mini- sculptures of folklore hero Badang and the Palembang prince Sang Nila Utama, who established the kingdom of Singapura. These accompanied an exhibition by the National Library Board on the stories and legends of early Singapore. Teo, who stores her works in cardboard boxes in her four-room Housing Board flat she shares with her husband, does not sell them as they are too fragile. Some giclee prints of her two- dimensional works, however, are available on e-commerce websites Etsy and Naiise. While paper art is often associated with arts and crafts, or origami, artists such as Suzann Victor are not hemmed in by these pre-conceived notions. Several years ago, Victor, 59, decided to “paint” with paper pulp during her residencies at STPI – Creative Workshop & Gallery, after she observed technicians making paper from pulp in the workshop. “I found out that they make paper in a liquefied process… I was fascinated by how the paper we take for granted every day has such a watery, liquid beginning,” says Victor, who decided to make paper the medium and subject of her works in her Immaculate Cloud series in 2015 and 2017. Victor added paper pulp to a pigmented liquid formula before adding the wet mixture, spoonful by spoonful, to clear acrylic discs. When the liquid dried, it left behind a wispy pattern on the discs, which were arranged in clusters and mounted onto gallery walls or suspended from the ceiling. The Sydney-based artist is now working on a new series featuring heat-burnt markings on paper. These images are created by the heat of the sun’s rays, which shine through carefully positioned magnifying lenses. In May, an exhibition at Mizuma Gallery, in Gillman Barracks, titled On/ Out Of Paper will feature “the non-conventional use of paper as an art medium”, says its curator Hermanto Soerjanto. Here, paper will no longer simply be a surface to be drawn or painted on. Rather, the show challenges the notion of paper as a “lesser” medium. South-east Asian collectors, too, often eschew paper works because these are susceptible to damage in the local climate, he says. He hope these views will change. Among the works on display are seven delicate, geometric paper sculptures by 28-year-old Singaporean artist Ashley Yeo. Each of these palm-sized creations was designed on Adobe Illustrator. Yeo would then print out the intricate designs and then cut them out before gluing them into shape. The painstaking process takes one to two months each time, says Yeo, who was last year shortlisted for the Loewe Craft Prize, an international craft award organised by Spanish luxury fashion house Loewe. These minimalist works can sometimes seem somewhat “invisible”. Not everyone realises the work that goes into them. “Some people say it’s only paper”, says Yeo. She, however, relishes the soft, “sentimental” quality of the material and feels that its lightness inspires a “rhythm of slowing down”. Curator Hermanto adds: “Traditionally, paper artworks are perceived as crafts… (but) it’s beyond craft… it’s fine art”. What artworks reside in the homes of Singapore artists?